Photos taken by a Minnesota Rollergirl of the 35W bridge collaspe. Price controls, chronic food and fuel shortages, and inflation officially estimated at 4,500 percent but probably much, much higher — this is life in Mugabe's Zimbabwe, the world's fastest-shrinking economy. A decade-long string of calamitous policies has reduced this fertile land — which once exported food to its neighbors — to one that can't feed itself. Hurricane Katrina victims whose homes and businesses were destroyed after floodwaters breached levees in the 2005 storm cannot recover money from their insurance companies for the damage, a federal appeals court ruled yesterday. The FBI violated the Constitution when agents raided U.S. Rep. William Jefferson's office last year and viewed legislative documents, a federal appeals court ruled Friday. Screeners from the Transportation Security Administration checked passengers at two Downtown city bus stops this morning, looking for weapons and suspicious behavior. Texas students will have four more words to remember when they head back to class this month and begin reciting the state's pledge of allegiance. This year's Legislature added the phrase "one state under God" to the pledge, which is part of a required morning ritual in Texas public schools along with the pledge to the U.S. flag and a moment of silence. State Rep. Debbie Riddle, who sponsored the bill, said it had always bothered her that God was omitted in the state's pledge. Senate Judiciary Committee Chairman Patrick Leahy (D-VT) couldn't even get Jennings to answer the question "what role you have in the selection of nominees to be U.S. attorneys." When Jennings refused to answer based on the President's assertion of executive privilege, Leahy cautioned, "now, let's not be too contemptuous of this committee, I'm just asking you what you do." The intense pressure and scrutiny that comes with attempting to break Major League Baseball's all-time hit-batsman mark, a once-thought untouchable record that has stood at 287 for over a century, came to a head yesterday when Craig Biggio lashed out against the media, blaming an avalanche of news coverage and reporters' ceaseless questioning for his recent hit-by-pitch slump. Over the past six years, a quiet revolution has occurred in the intelligence community toward wide-scale outsourcing to corporations and away from the long-established practice of keeping operations in US government hands, with only select outsourcing of certain jobs to independently contracted experts. Key functions of intelligence agencies are now run by private corporations. The Office of the Director of National Intelligence (ODNI) revealed in May that 70 percent of the intelligence budget goes to contractors. Money moves around. The AG waves his hands. It continues. Then Congress awakens. The Grand Jury is happy. The President is sad. Curious George does not get a bannana. He goes to the cage. Man in Yellow hat waves at him. They are still friends. Lukas Grunwald, an RFID expert who has served as an e-passport consultant to the German parliament, says the security flaws allow someone to seize and clone the fingerprint image stored on the biometric e-passport, and to create a specially coded chip that attacks e-passport readers that attempt to scan it. Record labels big and small are working toward the goal of turning every social network profile, blog and fan site into a digital music storefront. Will Bunch - We hate to say we told you so, but....we told you so: Those terrorist "dry runs" at airports that bumped a slew of bad news for President Bush off the front page and scared a lot of summer vacationers in the process, were, as CNN itself confessed in a different report, "bogus". Twenty-five years ago today I experienced IMHO, the Best. Concert. Ever. 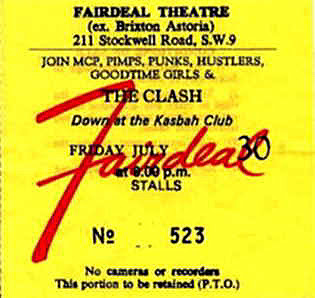 This show was, sadly, the first and last time I ever saw The Clash. When they opened up with "White Riot" the crowd went wild and never let up. I emerged from the show with a few minor bruises, a huge grin on my face and a lifelong love for The Clash. Whenever I hear their music I'm transported back to the stalls. I'm seventeen again and still looking for career opportunities. Mick’s last Clash gig in their hometown and it’s a terrific performance from its blistering start through to the finish. Mick’s father, it was reported was there the first time to see him play. Joe has since revealed that he had punched Mick full in the face previously for refusing to play White Riot. Mick had countered that Joe had no respect for the stage. It can only be guessed at why, for the only time since 76, they started with White Riot. Maybe because it was their last London gig of the tour and in Brixton. Known as the Fair Deal Hall, it would later be renamed Brixton Academy. It had only recently been opened for concerts and was ideal with a huge seat-less stalls area with seating upstairs. Irrespective of the reason, the impact on the audience was a shockwave of excitement, and as everyone surged forward the metal terrace-like stanchions collapsed. The British music press, previously critical, gave rave reviews for these Brixton concerts. Oh yeah, you may want to check out all these Clash bootlegs.